MainAll NewsInside IsraelWhy did Labor Vote to Continue Terrorist Benefits? Why did Labor Vote to Continue Terrorist Benefits? Labor party MKs explain why they voted to continue state benefits to terrorists freed early from prison. The Knesset passed a bill Wednesday in a preliminary hearing that would make Israeli Arab terrorists who are freed early from prison lose some state benefits. If the bill is made law, it will mean that freed terrorists with Israeli citizenship who leave jail early are ineligible for welfare or other benefits until the end of the term they were sentenced to spend in prison. Journalist Eliyahu Nissim set out to figure out why several MKs, primarily from the Labor party, opposed the bill in question. MK Amram Mitzna (Hatnua) is recorded as having voted against the bill, making him the only MK in the Coalition to have done so. Mitzna argued that he intended to vote for the bill, but accidently cast an opposing vote instead. Members of the Labor party, on the other hand, stated that they intentionally voted against the bill. MK Eitan Cabel, head of the Labor Knesset faction, argued that stripping terrorists who leave prison early of their benefits would do undue harm to their families. When Nissim pointed out that terrorists’ relatives would still be eligible for stipends, Cabel hinted that the Labor party might have supported the bill had it not been drafted by the Coalition. MK Yitzhak Herzog, head of the Labor party, was not present during the vote. He said he “doesn’t necessarily oppose” the bill, but declined to say whether he would have voted against the bill if he had been in Knesset that day. “I don’t know, from a legal perspective it’s a complicated issue,” he said. Nissim pointed out that terrorists were singled out because only terrorists are sometimes released from prison early as a diplomatic “gesture,” while other murderers must complete their sentences. 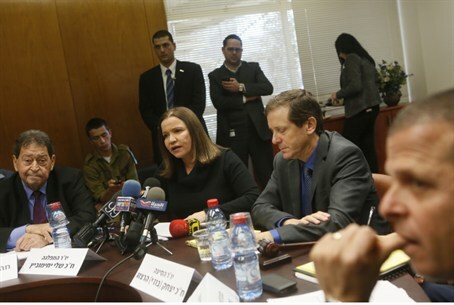 Mizrahi’s office responded with a statement saying the MK will look into the matter. Following his investigation Nissim declared that the Labor MKs had “poor excuses” for their votes, and accused them of putting party politics ahead of national interests. “I’m glad that logic won out, and that this bill – the brainchild of MKs Yariv Levin (Likud Beytenu), Penina Tamano-Shata (Yesh Atid), and Elazar Stern (Hatnua) – passed with an overwhelming majority of 54 for and 22 against – the members of Labor, Meretz, the Arab factions, and one confused Amram Mitzna,” he concluded.